OMG Posters! » Archive New Leia Bell Art Print, "Pinto Trio" - OMG Posters! 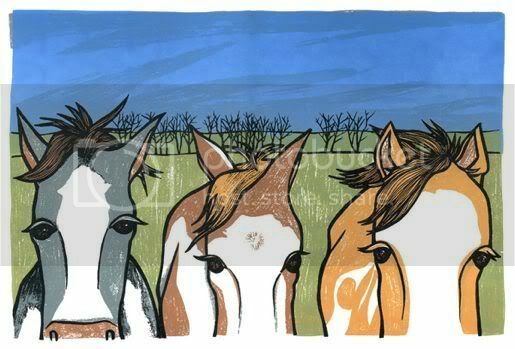 Leia Bell just released this new art print, Three Horses (aka Pinto Trio). It is a 17.5″ x 12.5″ screneprinted, has an edition of 100, and is only $19. You can still place orders till Dec. 15 to receive by Christmas. Visit LeiaBell.com. Finally, a nice Christian print on this website. How is this a christian print? For the record, I was rolling my eyes at the first post. Sorry, it’s finals week. Probably won’t be a whole lot of updates. How did the final for your cow milking class go? I’m not entirely sure how a close-up print of three horses descended into a theology lesson, but it’s interesting nonetheless. Sorry. I was just trying to answer Jeremy’s question. That said, I still don’t understand how this print his a “Christian” print. That first comment was odd. I took it as a joke. Also, Stoney, nice comment about the cow-milking. I think you’d be surprised by what I do for a living in the city. Here we are in the same place. My problem: A theology degree I never used. This is just retarded. Any further comments about religion will be deleted. How about your wheat harvesting final? First off, I don’t agree or disagree with any of it, I just don’t think this is the right arena in which to be discussing religion. Second of all, DeltaSigChi4 is an idiot, everyone on the internet knows it, it’s news to noone. Point taken. I’ll get back to why I come back to this place in the first place. So, is there a new Obey coming out tomorrow? Since I asked nicely and noone listened, I have deleted the comments that had nothing to do with the print. I’m all for an intelligent conversation, but some people are irresponsible and have to turn it offensive. I’m sure there are plenty of forums that you can argue religion on, a blog about prints isn’t one of them.